NEWINGTON – Police have charged a Manchester man with breaking into the Grantmoor Motor Lodge in February and setting a fire that sent four police officers and two patrons to the hospital to be checked for smoke inhalation. Guillermo Serrano, 27, of Manchester, allegedly started the fire when other guests were staying in the motor lodge the morning of Feb. 13, police said. A police officer on patrol noticed smoke billowing from a first floor room in the west wing of the motor lodge located at 3000 Berlin Turnpike at about 4:05 a.m. and called for help, Police Chief Stephen Clark said at the time. The officer began banging on doors to get patrons out and helped get a woman and her child who were staying in a room behind the unit on fire to safety, Fire Chief Christopher Schroeder said. All three were taken to the hospital to be treated for smoke inhalation, Schroeder said. Three other officers who arrived before firefighters and began banging on room doors were also taken to the hospital, officials said. All four officers were treated and released by 8 a.m. that morning, Clark said. The woman and child were taken to the hospital as a precaution, fire officials said. The room where the fire started had been rented out, but it was unclear if the patrons where in the unit when the blaze began, officials said. The blaze was traced back to Serrano who police believe forced entry into the room and intentionally set the hotel on fire. 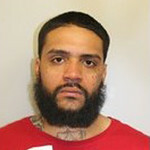 He was spotted by a Hartford detective sitting in a vehicle Tuesday and fled on foot when approached. He was taken into custody after a brief foot pursuit, police said. Serrano was charged with first-degree burglary, first-degree arson, first-degree criminal mischief and first-degree reckless endangerment. He was held on $750,000 bond after his arraignment in New Britain Superior Court today. Posted in New Britain Herald, Newington on Wednesday, 7 November 2018 12:02. Updated: Wednesday, 7 November 2018 15:03.